Engaging with bloggers is quickly becoming an important part of many marketing projects. 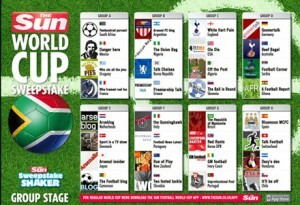 However, it looks like The Sun newspaper might have gone about it the wrong way with one of its World Cup promotions. 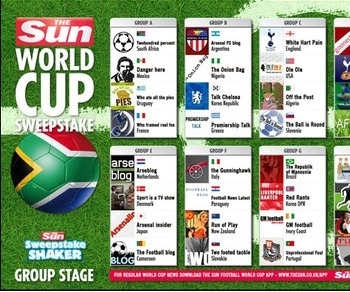 The Wall reports that a number of football bloggers are highly aggrieved by The Sun featuring their blogs into a World Cup Blogger Sweepstake. The newspaper has today taken down the offending web page, which displayed football blogs in the place of the countries participating the World Cup group stage. 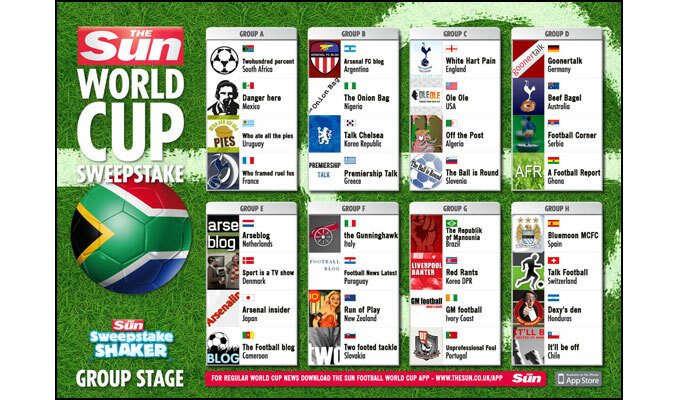 The idea, by the looks of it, was to flatter bloggers with attention to get them talking about a ‘World Cup Sweepstake Shaker’ app the newspaper is promoting. It appears they even asked permission to use the blogs. The problem? According to at least two of the blogs involved, they were added to the promotion regardless of whether they actually agreed. Ashley Norris of new media agency Shiny Red says on his Posterous blog that he didn’t reply to his email from the Sun (relating to Who Ate All The Pies, a project that actually closed last year) because he felt it marked a return to “the bad old days when old media used to patronise blogs and use them for their own promotional activities”. Unofficial FC United blog It’ll Be Off also ignored their Sun email and yet appeared in the promotion, prompting an angry post yesterday. Bloggers are often key influencers for their readers and that’s exactly why marketers want to engage with them. The problem is that if they do it wrong they can easily end up with some very public humiliation. Any guide to blogger relations will tell you that. It looks like The Sun has just found itself added to the ‘case studies of how not to do it’ list for many a social media consultant’s Powerpoint presentation.